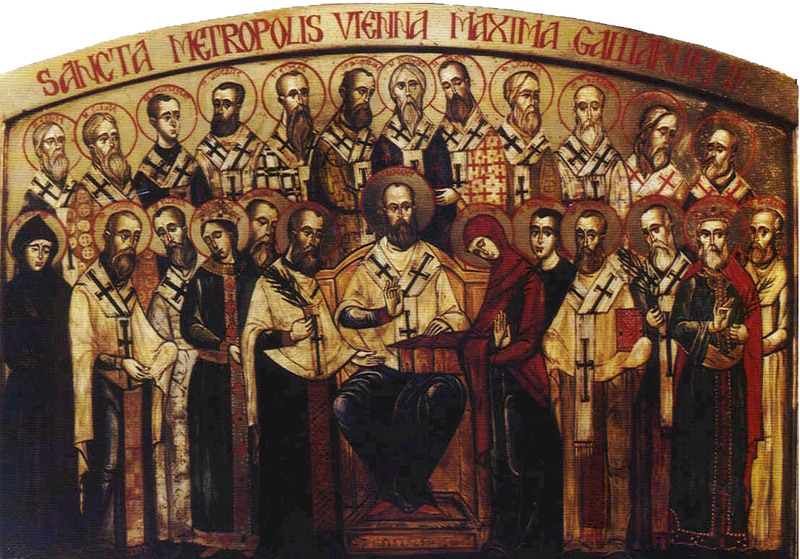 ARMOGASTES and COMPANIONS, members of the royal court, and orthodox Christians, who suffered in North Africa at the hand of the Arian Gaiseric, King of the Vandals (r. 428–477). After being tortured they were enslaved and initially sent to work the mines. Genseric wanted to behead the saints, but he was advised by a cleric at court not to, lest they be venerated as martyrs. They were then sent to live out the rest of their lives as cowherds circa 460. EUSTACE (EUSTASIUS), a monk and spiritual child of St. Columbanus (23rd November) at the Abbey of SS. Peter and Paul of Luxeuil, and his successor as Abbot of Luxeuil. During St. Eustace’s abbotship, there were over six hundred monks at the Abbey, and a seminary that trained many future bishops and saints. St. Eustace spent many hours in prayer daily, and was also a wonderworker, restoring sight to St. Sadalberga (22nd September), after she became blind. St. Eustace reposed in 625. FIRMINUS, a sixth century Bishop of Viviers in southern Gaul. He is said to have only served for a few months, or even weeks, before resigning in favour of his son. GWLADUS (GLADYS), (Fifth Century), a daughter of the famous King St. Brychan of Brycheiniog (6th June). St. Gwladus was the wife of St. Gwynllyw (vide infra), and mother of St. Cadog (24th January). There are no further reliable details of her life extant. GWYNLLYW (WOOLLOS), Gwynllyw Milwr or Gwynllyw Farfog, known in English as Woollos the Warrior or Woollos the Bearded (Latin: Gundleus, Gundleius or Gwenleue), was the King of Glywysing in South Wales and the legendary founder and patron saint of the City of Newport. According to Lives written some six hundred years after his repose, St. Gwynllyw Milwr was a feared warlord, raider, and associate of King Arthur. He later found religion, quite possibly under the influence of his son, St. Cadog (24th January) and wife St. Gwladus (vide supra), and became a hermit, at the location where St. Woollos Cathedral in Newport was later built. St. Gwynllyw reposed circa 500. LASAR (LASSAR, LASSERA), (Sixth Century), an Irish monastic St. Lasar was a niece of St. Fortchern (17th February). The noted hagiographer and historian John Colgan O.F.M. (†c. 1657) provides limited details of her life, of uncertain reliability, as do the Bollandists , in the Acta Sanctorum . From these it is known that she spent her early years in the care of SS. Finian (7th April) and Kieran (9th September) at Clonard, before entering an unknown monastery. SECUNDUS, a patrician and subaltern in the Imperial Roman Army, St. Secundus was baptised in Milan, and arranged the illegal Christian burial of St. Marcian (6th March), after the saint had been martyred. St. Secundus then fled to hide with his family in Asti in Piedmont, where he was arrested, tortured, and beheaded circa 119. AGERICUS (AGUY, AIRY), a spiritual child of St. Eligius of Noyon (1st December), and later Abbot of Marmoutier Abbey (abbaye de Marmoutier) just outside of Tours (Indre-et-Loire, France). St. Agericus reposed circa 680. GODEBERTHA, she received monastic tonsure from St. Eligius (1st December) at Noyon (about 100 km / 60 mi north of Paris). She later was the Founding-Abbess of a convent at Noyon. It is recorded in an early Vita that once when Noyon was was threatened with total destruction by fire, St. Godebertha made the sign of the cross over the flames, and the inferno was forthwith extinguished. St. Godebertha reposed circa 700. GUTHLAC, (Eighth Century), a prince of the house of Mercia and a noteworthy warrior, St. Guthlac renounced the world and received monastic tonsure at Repton Abbey in Derbyshire, England. He went on to spend the last fifteen to twenty years of his life as a hermit in the fens in Lincolnshire with growing renown for his sanctity and asceticism. St. Guthlac reposed 714. Later in the eighth century a monastic community formed and built Crowland Abbey over his tomb. The British Library possesses (Harley Roll Y.6) a vellum roll consisting of 17½ drawings depicting the life of St. Guthlac, known as the Guthlac Roll . ISAAC, a monk in Syria who fled persecution by the Monophysites. St. Issac settled in Monteluco near Spoleto in Umbria where he founded a monastery, from which he played an important role in the restoration of eremitical life to sixth century Italy. St. Isaac reposed circa 550. 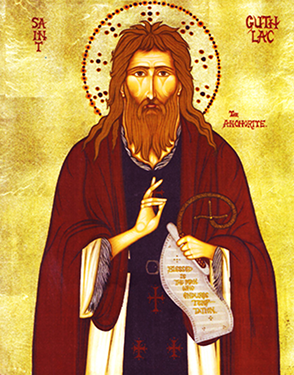 MACHAI, (Fifth Century), a disciple of St. Patrick (17th March), St. Machai founded a monastery on the Isle of Bute in the Firth of Clyde on the west coast of Scotland. MAEDHOG (AEDHAN, MOGUE), (Sixth Century), known for working many miracles during his life, St. Maedhog was an Abbot of Clonmore, in Co. Carlow, Ireland. A close ally of SS. Onchu (8th February) and Finan (7th April), he worked with them to promote peace amongst the Irish chieftains of the time.